In the video of this publication 'Coaching the TCU Transition Offense - Jamie Dixon', Coach Jamie Dixon of TCU speaks to the Texas High School Coaches Association on his offensive strategy. 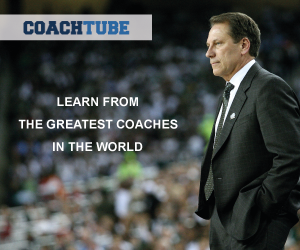 Watch as he takes you through the film of his offense and emphasizes the coaching points you need to know! En el video de esta publicación 'Coaching the TCU Transition Offense - Jamie Dixon', el Entrenador Jamie Dixon del TCU habla con la Asociación de Entrenadores de Escuelas Secundarias de Texas sobre su estrategia ofensiva. Observe cómo lo lleva a través de la película de su ofensiva y enfatiza los puntos de entrenamiento que necesita saber. Closeout Drills Featuring TCU's Jamie Dixon! In our eBA Basketball Statistics Analysis Clinics, the participants always ask about the applicability of our statistical system for high school basketball. It is inevitable: last years high school students get scouters attention ! We read in one of our articles in the Scouting section an appeal to the high school students "to be sure to enjoy their High School Basketball experience, and sell-out for the team ! Some student/athletes over-emphasize the recruiting process and end up under-achieving because of the excessive pressure they put on themselves to impress recruiters, an over-emphasis upon statistics, or saving themselves for college. Work hard, hustle, and play your game to help your team!" It is clear, from the name of our system and the site, that we are working for "basketball professional teams". I don't think that a complete statistical system must be applied in the High School, but about the fact that the high school coach must keep basics statistics we have no any doubt, specially on the last years. And its use and results must be emphasized in the coaching program: that's mean, the use of the stats to help the player to improve himself in the rights areas and to assist the coach in the programming of his trainings more accurately. Perhaps the clinics participants intended to ask if all this set of complex formulas of analysis are necessary at high school.... Please hear to this old basketball coach and statistician analyst: all the time you can.... work with your players on basketball fundamentals ! The future NBA Coach of your actual players will give, however secretly, the credit to You....! Read More at eBA ENCYCLOPEDIA ONLINE, search "statistical system for High School" in this blog and consult the eBA Basketball Statistics Creative Analysis System. Add Steph Curry's Pull Back Crossover to your arsenal on the court with Nike Basketball's Signature Moves. Take Every Advantage. Basketball Beautiful Faces on APRIL 2018 Cover from the EuroLeague 2018 ! With the žALGIRIS KAUNAS DANCERS TEAM ! With Erika G., from the best... from the EuroLeague ! With the žALGIRIS KAUNAS DANCERS TEAM ! With Erika G., a žALGIRIS KAUNAS dancer performing during the last game ! !